In June of 2017, volunteers from Unit 86 of the Arboretum Foundation and volunteers and staff from the Hyde Herbarium at the Center for Urban Horticulture collected Maple tree specimens from 28 different Maples in the Japanese Garden. 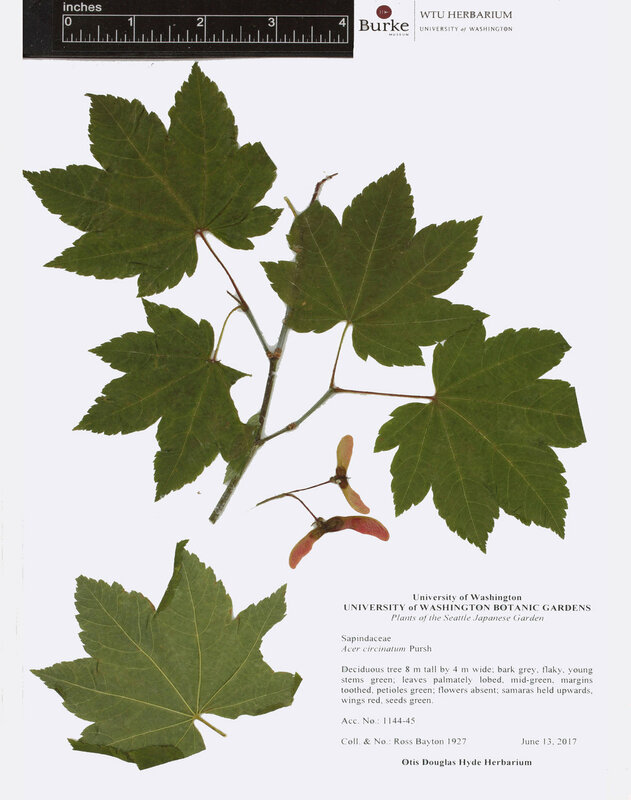 These leaves, stems and seed capsules were then dried, mounted and preserved in the Hyde Herbarium and at the Japanese Garden. The pressed pieces were photographed at the Burke Museum Herbarium. This Exhibit displays photographs of 12 of the 28 trees in both the mounted herbarium form as well as photographs of the actual trees in the garden. This 2017 Maple Collection updates the previous collection from 1984 and gives us an historical record of the Maples in the Japanese Garden. Join us for an opening reception for this special exhibit from 3pm -4:30pm on Thursday, October 4. The exhibit will be on display in the Tateuchi Community Room till the end of the season. Admission to the garden is FREE after 3pm for Free First Thursday. Light refreshments provided.